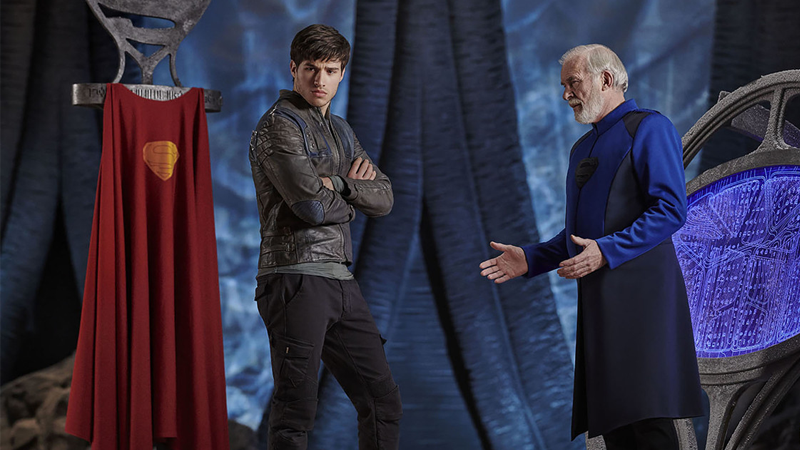 Seg-El, Superman’s grandfather (Cameron Cuffe), and Val-El (Ian McElhinney) in Krypton. It can be easy to immediately dismiss Krypton, the new Syfy series premiering tonight, as another TV prequel for a beloved DC Comics superhero, just like Gotham. Since the alien planet is best known for exploding, most people might think they even already know the show’s plot. But despite being set 200 years before baby Kal-El was sent to Earth, Krypton isn’t ever going to be waiting for Superman to be born. Last December, io9 traveled to visit the set, located in Belfast, Northern Ireland, to check out what we thought would be a show about a dying planet, but is instead about Krypton in its prime—and has the potential to be a high concept scifi series with Game of Thrones-esque politics. There’s even a time travel element that essentially puts all the toys from the DC Universe on the table. “What you thought you knew about the fate of Krypton, you can forget; it’s not going to go down that way,” promised showrunner Cameron Welsh. From what we saw, he’s not wrong. Cuffe’s Seg-El joined by Shaun Sipos as Krypton’s new take on DC hero Adam Strange. Although we all know Krypton best as the birthplace of Superman that later explodes, setting the show two centuries in the past avoids virtually all the comics, cartoon, and live-action looks at the planet, which inevitably focus on Krypton’s final days and the scientist Jor-El trying futilely to save it. Instead, Krypton primarily focuses on Superman’s granddaddy Seg-El (Cameron Cuffe) when he was a young man, as well as Kryptonian society as a whole. The short answer is that it’s no utopia. Despite the theocracy, and a terrorist threat from the Black Zero faction, Kandor is portrayed as a functioning society. The city is organized into guilds—Religious, Technician, Lawmaker, Military, Artisan, Science—who live the good life in towers that stretch to the sky. Kandorians are sorted into guilds before birth via the Genesis Chamber, which determines what people are genetically bred to do, who to marry, etc. Meanwhile, the “Rankless” class exist in the “basement of the city,” as Welsh describes it. The cavernous slums are grey, dimly-lit and plagued by police brutality. Although it isn’t all bad: There is a pub, owned by Seg’s friend Kem (Rasmus Hardiker), where people can grill some insects or reptiles over blue Kryptonian stones. This district is where viewers meet Seg. He is a street kid whose family lost the “El” name, and its status, when his grandfather Val-El (Ian McElhinney) defied the religious leader, the Voice of Rao. “The reason Val was executed was he believed there was life beyond Krypton, intelligent life that existed out there,” said Welsh. Val’s belief and attempts to explore space were sacrilege, and after his death, the planet’s nascent space program was abandoned. “His morals aren’t fully formed,” said Cuffe. “Superman’s greatest power is he knows what’s right, and Seg has no concept of that yet… and [he’s] totally unprepared for what comes his way,” said Cuffe. There are two beings coming to Krypton, and the first is Adam Strange, a classic DC hero from the ‘50s. In the comics, he’s teleported to a far-away alien planet to protect it with his ray gun and jetpack. In Krypton, he’s ditched his costume and arrives in Kandor dressed in modern-day Chucks, hoodie, and Detroit Tigers ball cap. This Adam Strange (Shaun Sipos) is early in his career as a hero and has traveled back in time to warn Seg of an impending threat to the planet by way of another classic DC characters, Brainiac (Blake Ritson). Essentially, Strange has to convince Superman’s grandfather to help him save Krypton, just to ensure Kal-El is born. Blake Ritson as Krypton’s version of Brainiac. A Superman TV series, even one technically without Superman, still requires a planet-sized threat. Krypton delivers with Brainiac, an iconic villain who is one of Superman’s greatest foes, right alongside Lex Luthor and General Zod. But no other villain has quite the same relationship with Kandor as Brainiac, who famously miniaturized the city and kept it in a bottle on his journey across the universe to collect worlds. 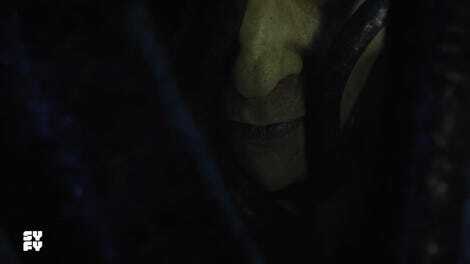 Teased in Syfy promotional materials, the green-skinned Brainiac is headed to Krypton in his iconic skull-shaped ship. It’s the first live-action depiction of the classic comic book villain introduced in 1958. “I feel like DC has been hanging on to him for the exact right project, right time,” said Ritson. Unfortunately, Brainiac “preserving” these cultures usually means saving their data in his databanks, and then destroying their physical forms. In the comics, the villain is often credited with destroying Krypton, just after seizing Kandor. Though the planet is most famous for producing a super man, the women of Krypton carry a lot of weight on the show. Most well-known is Ann Ogombo (the Amazonian Philippus from Wonder Woman), who plays Jayna Zod, the leader of Kandor’s military guild, as well as the grandmother to the future villain General Zod. The other female leads on the show include Georgina Campbell as Lyta Zod, Jayna’s daughter, and Wallis Day as Nyssa Vex. Because members of the guilds are paired off with a partner, love isn’t a consideration in relationships. While Lyta and Nyssa do end up being part of relationship drama with Seg and Dev-Em (Aaron Pierre), that’s not what defines their characters. According to Welsh, the Zod way is to traditionally be the warriors and protectors of Krypton, but Lyta questions everything about the society she lives within. She empathizes with the Rankless, and questions why her position in the guild perpetuates subjugating the downtrodden, which puts her in opposition with her mother. Day describes Nyssa as a highly intelligent, fierce, bisexual woman who is decisive—but not necessarily to be trusted. She is betrothed to Seg, but it’s done via her own manipulations because of her ulterior motives. Inside the multicolored halls of the Military Guild. The run-down slums of the Rankless District. The sparse furnishings of Seg-El’s house. Because Krypton is not connected to other live-action DC properties, Krypton has the ability to rewrite Superman’s history, and go in any direction instead of heading down a path even non-comic book fans know. And the time-travel twist allows Krypton to tap into the entire DCU, from any era. DC’s Chief Creative Officer Geoff Johns promised there’s no limit to what heroes and villains could appear on the series and promised that future living weapon and Superman-killer Doomsday will eventually arrive. Krypton is obviously set before Superman’s home planet explodes, so it’s technically a prequel, but it’s not the story of a ticking time bomb. It’s made some smart decisions, allowing it to be unencumbered by continuity in a way that will allow it far more freedom than it may appear—as well as a treasure trove of characters and situations at its disposal. And even though Superman won’t be born for 200 years, Welsh emphasizes this is still a hero’s journey. Seg isn’t quite the grandfather to Kal-El yet, but his ultimate arc is to lead a revolution to restore the planet to a golden age and help make Krypton the world that gave birth to Superman. Krypton premieres tonight, March 21, at 10:00 pm on Syfy. Aaron Sagers is a professional nerd, journalist, TV host & radioactive spider bite survivor based in NYC.